Through a series of misunderstandings, Alvin, Simon and Theodore come to believe that Dave is going to propose to his new girlfriend in New York City, and dump them afterwards. They have three days to get to him and stop the proposal, saving themselves not only from losing Dave but possibly from gaining a terrible stepbrother. 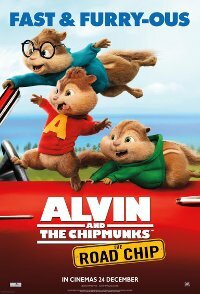 The fourth film featuring Alvin and friends, it struggled at the US box office, and got battered by the press. Adventure, Animals, Animated, Comedy, Family, Fantasy, Musical. So who wants to drive today?